The graduates stand during the processional and await the awarding of their degrees. Photo by H.Carnahan/Setonian. 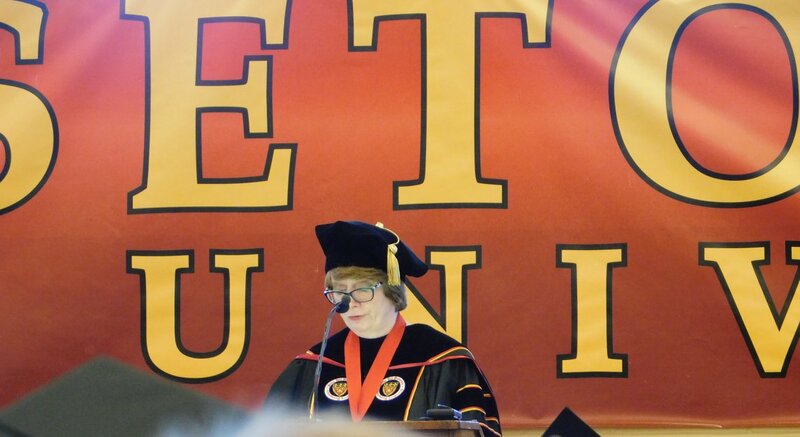 325 students graduated from Seton Hill University’s Centennial commencement ceremony on May 12. Graduates hailed from around the world and earned degrees in various fields of study, from the humanities to the sciences. The Sisters of Charity were also honored at commencement with the awarding of the Presidential Medal of Distinction, which was accepted by Sister Catherine Meinert, provincial superior and president of the U.S. Province of the Sisters of Charity of Seton Hill. They are the third recipients of the medal in SHU’s history.